This is the story of the barbel as told in the angling literature, although the tale starts, as it does with virtually all British fresh water fishes, as land reappeared from under the ice sheets ten thousand years ago. The barbel featured on the menu on a regular basis by late medieval times, although even allowing for the different tastes of the time it was regarded as being ‘inedible at best’, but that didn’t protect it from over-harvesting and Elizabeth the First had to introduce a twelve inch size limit (the penalty for taking under-sized fish being a stonking twenty quid fine). By Walton’s time, the barbel was well established as a sport fish, but the majority of the words devoted to it have been written since the beginning of the nineteenth century with most of those penned in our times. 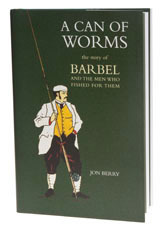 The second half of A Can of Worms deals with the subject on a regional basis, including a fascinating account of Operation Barbel, which spread the fish netted in Berkshire from the Stour to the Severn. Among the appendices is a very useful ten page annotated ‘barbel library’, so beginner or expert, there is something in here for everyone. I somehow doubt that anyone will ever write a better history of the quest to catch barbel. If barbel are your bag, this should be an automatic purchase.